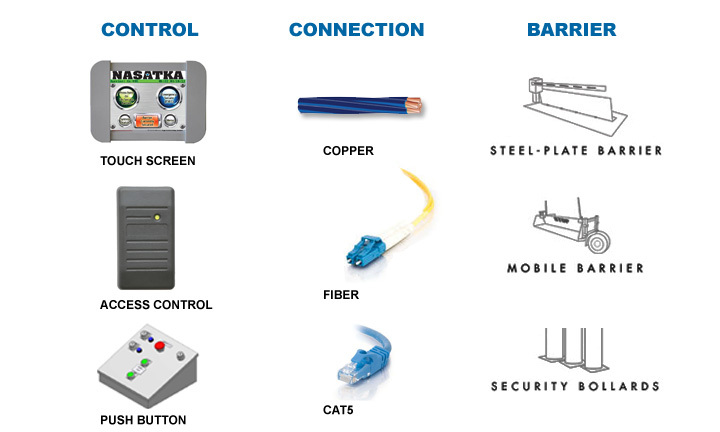 Nasatka’s control architecture provides the flexibility, reliability and security protection demanded by Security Directors and Force Protection experts worldwide. Nasatka’s controls support a two or three tier architecture in which all communication can be encrypted and all devices are fully supervised. Our standard color touchscreen provides a 5.7 in. color LCD (liquid-crystal display) for operational control of the vehicle barrier, when used in conjunction with a Rampart control panel. The touch screen allows full-Rampart system programming, including all programming options. A scrolling status bar allows the user to view the system status during normal operation. User login protocols via a keypad or keyboard provide high-level security measures. 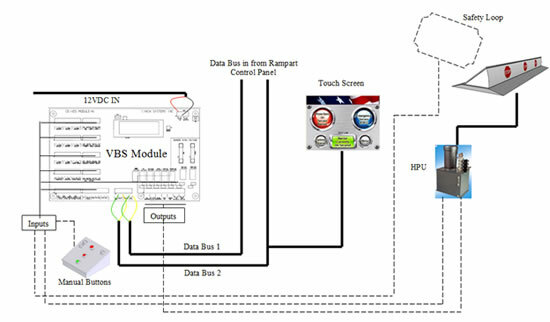 Touchscreens communicate via a data bus originated within the Rampart control panel. All communications are supervised, and we offer a programmable system option that reverts to redundant manual buttons in case of a failure. • Secure Advanced Encryption Standard (AES) with up to 256 bit key sizes compliant with Federal Information Processing Standard (FIPS) Publication 1971. 1Encryption capability described herein may require U.S. Government authorization for export purposes. Diversion contrary to U.S. law is prohibited. Export Control. Certain cryptographic devices and technical data regarding them are subject to U.S. Federal Government export controls. Exports of cryptographic modules implementing this standard and technical data regarding them must comply with these Federal regulations and be licensed by the Bureau of Export Administration of the U.S. Department of Commerce. Applicable Federal government export controls are specified in Title 15, Code of Federal Regulations (CFR) Part 740.17; Title 15, CFR Part 742; and Title 15, CFR Part 774, Category 5, Part 2.